Are Republican Presidents better for the Equity Market? Perception vs. Reality: Are (more business friendly) Republican Presidents better for the Equity Market? Daniel Kahneman, the Nobel Prize in Economic Sciences in 2002, wrote a best-selling book entitled “Thinking, Fast and Slow”. The central thesis of the book is that human beings have two modes of thought: System 1: Fast, instinctive and emotional; System 2: Slow, deliberative and logical. We can say that System 1 resembles the PERCEPTION, whereas, System 2 is closer to the REALITY. Being so fast and so emotional, sometimes the PERCEPTIONS may distort or exaggerate the news delivered by the market, whereas REALITY gives the investor a medium-long term framework to better assess the market situation. Discover our monthly series “Perception vs. Reality”! Source: Bloomberg. Performance: S&P500 Price Only. Republican led administrations in the US are typically more business friendly than Democrat ones. Republicans are more likely to decrease taxes, to deregulate markets, to better control the budget deficit, to decrease the Government size and generally speaking to create a better environment for companies. Looking at history, Republican Presidents have had in their cabinet more business people to lead the country. As a dramatic example, Trump’s cabinet has about 50% of its members with a business background, the highest proportion since WWII, whereas Obama’s administration had only 10% on a comparable basis, which was the lowest proportion since WWII. 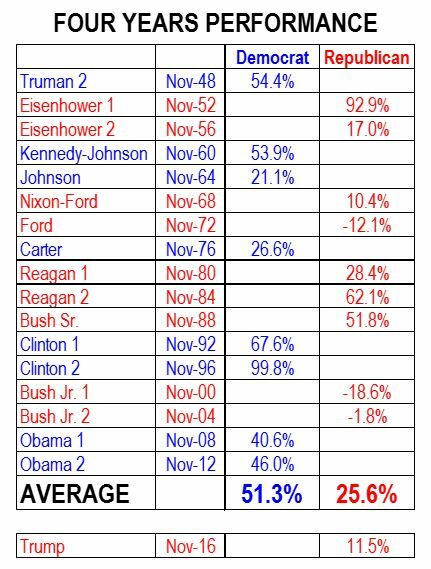 With these hard data, investors can infer that US stock markets should have performed better while a Republican President was in office, and also will expect a good equity market during Trump’s government. Clinton took office after the 1991 US recession, so his first mandate took place during an economic recovery that was due after the recession, and so the market made 67.6% in 4 years. Ford was unlucky to be President when the OPEC started to push oil prices up. Obama was lucky to start his presidency when the SP500 had just collapsed and was quoted at 11.8 times 12M forward earnings. Besides all these specific situations, it is very important to remember that the US is a very strong democracy with many checks and balances, with powerful House, Senate and Governors who have a big influence in politics and in the economy. Likewise, US corporates are very strong and well managed and have a profit cycle that might be independent of the political party of the President. In the US (and in most developed economies), politics are much less influential on the performance of equity market than what people think, whereas the most typical financial and economic factors remain the best indicators for expected equity performance: FED hiking rates is not good news; lower corporate taxes will be good news; deregulation will be good news; a high PE ratio (17.9 today) is not good news, etc. The market will switch from a Trump led market to an economic led market. Next Chart of the Month - Active management is back but beware of the next equity sector rotation!